Chinese spies repeatedly infiltrated U.S. national security agencies, including official email accounts, and stole U.S. secrets on Pentagon war plans for a future conflict with China, according to a forthcoming congressional commission report. "The United States faces a large and growing threat to its national security from Chinese intelligence collection operations," states the late draft report of the U.S.-China Economic and Security Review Commission. "Among the most serious threats are China’s efforts at cyber and human infiltration of U.S. national security entities." Chinese intelligence activities have "risen significantly" in the past 15 years and are conducted through several spy services, including the Ministry of State Security (MSS), the People's Liberation Army (PLA), and Communist Party military organizations such as the PLA General Political Department and the Party's United Front Work Department. A copy of the draft annual report for 2016 was obtained by the Washington Free Beacon. The final report will be released Nov. 16. The report identified repeated infiltrations by Chinese spies of U.S. national security entities, including the FBI and the U.S. Pacific Command. Defense officials said one of the more damaging spy cases involved retired Lt. Col. Benjamin Pierce Bishop, a defense contractor at the U.S. Pacific Command, who pleaded guilty in March 2014 to supplying classified information to a Chinese woman he dated. The compromised information included secret U.S. war plans, nuclear weapons and deployment information, secrets on the MQ-9 Reaper drone, and a classified report titled "The Department of Defense China Strategy." Other Chinese human intelligence operations included the case in 2010 of James Fondren, a high-ranking Pacific Command official who passed a secret 2008 National Defense Strategy report to China; and Gregg Bergersen, who passed secrets to China until his arrest in 2008. Both were recruited by PLA spies. In addition to targeting officials with access to secrets, Chinese intelligence is targeting American academics at think tanks involved in China studies and, in at least one case, an American student in China, Glenn Duffie Shriver. "Chinese intelligence has repeatedly infiltrated U.S. national security entities and extracted information with serious consequences for U.S. national security, including information on the plans and operations of U.S. military forces and the designs of U.S. weapons and weapons systems," the report said. "This information could erode U.S. military superiority by aiding China’s military modernization and giving China insight into the operation of U.S. platforms and the operational approaches of U.S. forces to potential contingencies in the region." Additionally, the report states that China cyber operations have targeted critical U.S. infrastructure, such as the electrical power grid and financial networks. "U.S. critical infrastructure entities are a major target of Chinese cyber operations, and China is capable of significantly disrupting or damaging these entities," the report says. Regarding intelligence targeting of American decision makers, the report noted that MSS hackers conducted the cyber attacks against the Office of Personnel Management last year involving the theft of records on 22 million federal employees. In August, an FBI electronics technician, Kun Shan "Joey" Chun, pleaded guilty to acting as a Chinese agent after passing sensitive data to China about FBI surveillance technologies. "Among the information extracted were 5.6 million fingerprints, some of which could be used to identify undercover U.S. government agents or to create duplicates of biometric data to obtain access to classified areas," the report said. Chinese intelligence also hacked and infiltrated the personal email accounts of many Obama administration officials, the report said. Chinese cyber espionage is carried out by what the report said was a "large, professionalized cyber espionage community." "Chinese intelligence services have demonstrated broad capabilities to infiltrate a range of U.S. national security (as well as commercial) actors," the report says. "Units within the former 3PLA, in particular, have been responsible for a large number of cyber operations against U.S. actors." Other targets of cyber attacks include U.S. diplomatic, economic, and defense industrial sectors involved in supporting American national defense programs. The data could be used to support Chinese military modernization, as well as provide Chinese Communist leaders with insights into U.S. leadership perspectives on key China issues. Chinese military planners also would benefit from the intelligence activities by helping "build a picture of U.S. defense networks, logistics, and related military capabilities that could be exploited during a crisis." China's government also uses unofficial spies to gather information. "In addition to the cyber espionage elements of the MSS and PLA, many unofficial Chinese actors target the United States with cyber espionage operations," the report said. "These actors include government contractors, independent ‘patriotic hackers,' and criminal actors," the report added. "Distinguishing between the operations of official and other Chinese cyber actors is often difficult, as is determining how these groups interact with each other. Some reports suggest China is shifting cyber espionage missions away from unofficial actors to centralize and professionalize these operations within its intelligence services." Spy targets include cyber intrusions of defense and military systems that are allowing China to spy on deployed U.S. military forces. "Moreover, by infiltrating and attempting to infiltrate defense entities in U.S. ally and partner countries, China could affect U.S. alliance stability and indirectly extract sensitive U.S. national defense information," the report says. The annual report also concludes that despite extensive ties between Beijing and Washington, "U.S.-China relations over the past year continued to be strained." Among the causes of tensions are Chinese territorial claims in the South China Sea, U.S. arms sales to Taiwan, the deployment of missile defenses in South Korea, Chinese cyber attacks, and the U.S. "rebalance" to Asia. 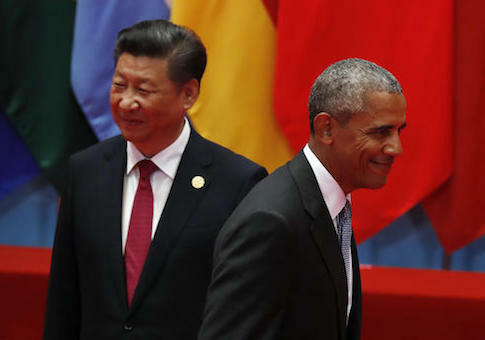 Despite a September 2015 U.S.-China agreement not to conduct government-sponsored cyber economic espionage, "Chinese cyber espionage against a range of U.S. entities continued in 2016, to the detriment of U.S. economic and national security," the report said. In a related development, an Agriculture Department geneticist pleaded guilty on Monday to making false statements to the FBI as part of an economic espionage case involving China. Wengui Yan lied to FBI agents about plans by a group of Chinese tourists to steal U.S. genetically-modified rice samples, Reuters reported Wednesday. This entry was posted in National Security and tagged China, Pentagon. Bookmark the permalink.